The Federation of Australia was the process by which the six separate British self-governing colonies of Queensland, New South Wales, Victoria, Tasmania, South Australia, and Western Australia agreed to unite and form the Commonwealth of Australia, establishing a system of federalism in Australia. Fiji and New Zealand were originally part of this process, but they decided not to join the federation. 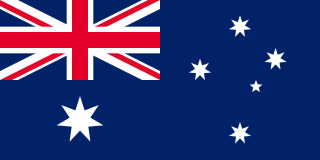 Following federation, the six colonies that united to form the Commonwealth of Australia as states kept the systems of government that they had developed as separate colonies, but they also agreed to have a federal government that was responsible for matters concerning the whole nation. 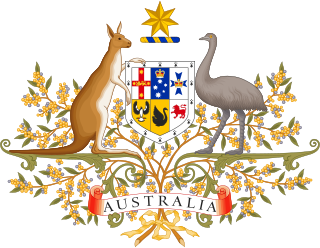 When the Constitution of Australia came into force, on 1 January 1901, the colonies collectively became states of the Commonwealth of Australia. While the overwhelming majority of the population reside in the city of Canberra in the ACT's north-east, the Territory also includes some surrounding townships such as Williamsdale, Naas, Uriarra, Tharwa and Hall. The ACT also includes the Namadgi National Park which comprises the majority of land area of the Territory. Despite a common misconception, the Jervis Bay Territory is not part of the ACT although the laws of the Australian Capital Territory apply as if Jervis Bay did form part of the ACT. The Territory has a relatively dry, contintental climate experiencing warm to hot summers and cool to cold winters. Williamsdale is a township on the New South Wales - Australian Capital Territory border in Australia on the Monaro Highway. The postcode is 2620. The former Bombala railway line passes through the village and a railway station saw service until 1975. Naas Valley is an area south of Canberra, Australia in the Brindabella Ranges which was first settled by Europeans in 1834. The watershed of Naas Creek forms the southern and south-eastern boundary of the Australian Capital Territory, as specified in the Seat of Government Acceptance Act 1909. Tharwa is a township within the Australian Capital Territory, 35 kilometres (22 mi) south of Canberra, the capital city of Australia. At the 2016 census, Tharwa had a population of 81. The Parliament of Australia is the legislative branch of the government of Australia. It consists of three elements: the Crown, the Senate and the House of Representatives. The combination of two elected chambers, in which the members of the Senate represent the states and territories while the members of the House represent electoral divisions according to population, is modelled on the United States Congress. Through both chambers, however, there is a fused executive, drawn from the Westminster system. The National Triangle, which is referred to as the Parliamentary Triangle, is the ceremonial precinct of Canberra, containing some of Australia's most significant buildings. The National Triangle is formed by Commonwealth, Kings and Constitution Avenues. Buildings within the National Triangle have been located and designed intentionally for visual effect, and those of national significance are popular tourist attractions. During the first 20 years of settlement, there was only limited contact between the settlers and Aboriginal people. Over the succeeding years, the Ngunnawal and other local indigenous people effectively ceased to exist as cohesive and independent communities adhering to their traditional ways of life. Those who had not succumbed to disease and other predations either dispersed to the local settlements or were relocated to more distant Aboriginal reserves set up by the New South Wales government in the latter part of the 19th century. In 1898, a referendum on a proposed Constitution was held in four of the colonies – New South Wales, Victoria, South Australia and Tasmania. Although the referendum achieved a majority in all four colonies, the New South Wales referendum failed to gain the minimum number of votes needed for the bill to pass. Following this result, a meeting of the four Premiers in 1898 heard from George Reid, the Premier of New South Wales, who argued that locating the future capital in New South Wales would be sufficient to ensure the passage of the Bill. The 1899 referendum on this revised bill was successful and passed with sufficient numbers. Section 125 of the Australian Constitution thus provided that, following Federation in 1901, land would be ceded freely to the new Federal Government. This, however, left open the question of where to locate the capital. 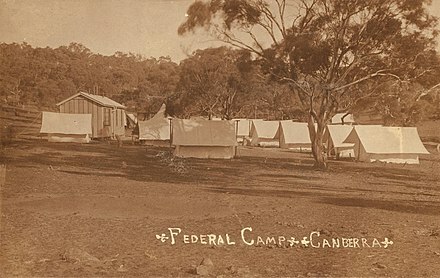 In 1906 and after significant deliberations, New South Wales agreed to cede sufficient land on the condition that it was in the Yass-Canberra region,  this site being closer to Sydney. Initially, Dalgety remained at the forefront, but Yass-Canberra prevailed after voting by federal representatives. The Seat of Government Act 1908 was passed in 1908, which repealed the 1904 Act and specified a capital in the Yass-Canberra region. Government surveyor Charles Scrivener was deployed to the region in the same year in order to map out a specific site and, after an extensive search, settled upon the present location. It is bounded by the Goulburn-Cooma railway line in the east, the watershed of Naas Creek in the south, the watershed of the Cotter River in the west and the watershed of the Molonglo River in the north-east. These boundaries were set to give the ACT an adequate water supply. The ACT extends about 88.5 kilometres (55.0 mi) North-South between 35-36S and 57.5 kilometres (35.7 mi) West-East at around 149.6E, although the city area of Canberra occupies the north-central part of this area. Unlike other self-governing Australian territories (for example, the Northern Territory), the ACT does not have an Administrator. The Crown is represented by the Australian Governor-General in the government of the ACT. Until 4 December 2011, the decisions of the assembly could be overruled by the Governor-General (effectively by the national government) under section 35 of the Australian Capital Territory (Self-Government) Act 1988, although the federal parliament voted in 2011 to abolish this veto power, instead requiring a majority of both houses of the federal parliament to override an enactment of the ACT. The Chief Minister performs many of the roles that a state governor normally holds in the context of a state; however, the Speaker of the Legislative Assembly gazettes the laws and summons meetings of the Assembly. The court system of the Territory consists of the Supreme Court of the Australian Capital Territory, the Magistrates Court of the Australian Capital Territory and the ACT Civil and Administrative Tribunal. It is unique in that the Territory does not have an intermediary court like other mainland states and territories; there is only the superior court and a court of summary jurisdiction. As of April 2019 [update] the Chief Justice is Helen Murrell and the current Chief Magistrate is Lorraine Walker. As of May 2004, 30% of people in the ACT aged 15–64 had a level of educational attainment equal to at least a bachelor's degree, significantly higher than the national average of 19%. The two main tertiary institutions are the Australian National University (ANU) in Acton and the University of Canberra (UC) in Bruce. There are also two religious university campuses in Canberra: Signadou is a campus of the Australian Catholic University and St Mark's Theological College is a campus of Charles Sturt University. Tertiary level vocational education is also available through the multi-campus Canberra Institute of Technology. Canberra and the Territory have a daily newspaper, The Canberra Times , which was established in 1926. There are also several free weekly publications, including news magazines CityNews and Canberra Weekly. The Jervis Bay Territory is a territory of the Commonwealth of Australia. 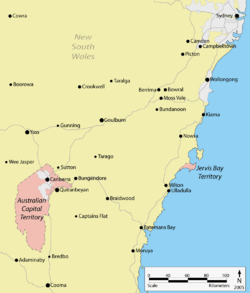 It was surrendered by the state of New South Wales to the Commonwealth Government in 1915 so the Australian Capital Territory would have access to the sea. The Barton Highway is a short highway in New South Wales and the Australian Capital Territory, Australia. The District of Tuggeranong is one of the original eighteen districts of the Australian Capital Territory used in land administration. The district is subdivided into divisions (suburbs), sections and blocks and is the southernmost town centre of Canberra, the capital city of Australia. The district comprises nineteen suburbs and occupies 117 square kilometres (45 sq mi) to the east of the Murrumbidgee River. The Division of Fenner is an Australian Electoral Division in the Australian Capital Territory and the Jervis Bay Territory. As of the 2018 redistribution, it includes Gungahlin and the part of Belconnen north of Belconnen Way and west of Eastern Valley Way, Aikman Drive and William Slim Drive. It also includes the Jervis Bay Territory. The Queanbeyan River, a perennial stream that is part of the Molonglo catchment within the Murray–Darling basin, is located in the Monaro and Capital Country regions of New South Wales and the Australian Capital Territory, in Australia. The river is 104 kilometres (65 mi) in length with a catchment area of 96,000 hectares. The Queanbeyan River and the Cotter River meet the potable water supply needs of the Canberra and Queanbeyan region and whose water quality is specifically protected under Federal legislation. Charles Throsby was an Australian explorer, pioneer and parliamentarian. He opened up much new land beyond the Blue Mountains for colonial settlement. He was a grazier, and became a prominent member of New South Wales society. Googong Dam is a minor ungated earth and rock fill with clay core embankment dam with concrete chute spillway plus a nearby 13 metres (43 ft) high earthfill saddle embankment across the Queanbeyan River upstream of Queanbeyan in the Capital Country region of New South Wales, Australia. The dam's purpose includes water supply for Canberra and Queanbeyan. The impounded reservoir is called Googong Reservoir. Canberra railway station is located on the Bombala railway line in the Australian Capital Territory, Australia. It is located in the Canberra suburb of Kingston. The Canberra Region Rugby League competition is more commonly known as the Canberra Raiders Cup, covering the Australian Capital Territory and surrounding New South Wales towns Queanbeyan, Goulburn and Yass. The competition is run under the auspices of the Country Rugby League and players are eligible for selection in the Canberra Division of the CRL Tier 1 Divisional Championships. The Canberra district competition has an under 18s, reserve and first grade competitions. From 2016, the 25-member unicameral Australian Capital Territory Legislative Assembly is elected from five multi-member electorates, with five seats per electorate. 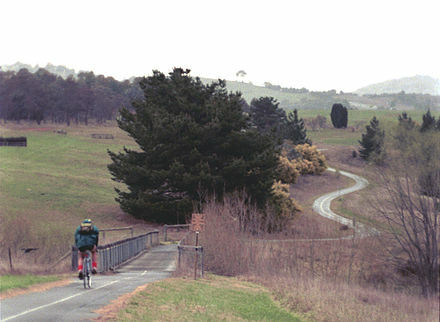 The District of Molonglo Valley is one of the nineteen districts of the Australian Capital Territory used in land administration, and the only district that was not created in 1966. The district is subdivided into divisions (suburbs), sections and blocks and is the newest district of Canberra, the capital city of Australia. The district is planned to consist of thirteen suburbs, planned to contain 33,000 dwellings, with an expected population of between 50,000 and 73,000. To be developed in three stages over more than ten years, the district will contain a principal town centre and a secondary group centre, with residential suburbs located to the south and north of the Molonglo River; located to the west of Lake Burley Griffin. The Division of Fraser was an Australian Electoral Division in the Australian Capital Territory and the Jervis Bay Territory. The division was created in a redistribution of the former Division of Australian Capital Territory, gazetted on 19 April 1974. It was named for Jim Fraser, who was the Member for Australian Capital Territory from 1951 to 1970. It encompassed the northern suburbs of Canberra, including the districts of Belconnen, Gungahlin, North Canberra and also the Jervis Bay Territory. It also generally included the land in the ACT north of the Molonglo River and Lake Burley Griffin, although at one time it included some suburbs in the inner south and immediately prior to its abolition it had lost Reid and Campbell to the division of Canberra. It was always a safe seat for the Australian Labor Party. Energy produced in the Australian Capital Territory mainly consists of solar electricity. Electricity consumed in the Australian Capital Territory mainly comes from the national power grid through substations at Holt and Fyshwick. The ACT currently mandates that 90 percent of its electricity, amounting to 550 megawatts, will be supplied from renewable sources by 2020. The ACT has four solar farms capable of generating about 36 megawatts. From 1913 until the mid 1950s some power was produced from the Kingston Powerhouse, a thermal power station in Kingston. ↑ "Australian National Accounts: State Accounts, 2017-18". Australian Bureau of Statistics. 16 November 2018. Archived from the original on 17 November 2017. Retrieved 19 April 2019. ↑ Time to Talk Canberra. "ACT Flags and Emblems". CMD.act.gov.au. Retrieved 17 July 2016. 1 2 "Jervis Bay Territory Governance and Administration". Department of Infrastructure and Regional Development. Retrieved 8 April 2019. 1 2 3 4 5 6 7 8 9 10 11 Australian Bureau of Statistics (27 June 2017). "Australian Capital Territory". 2016 Census QuickStats. Retrieved 27 June 2017. This article contains quotations from this source, which is available under the Attribution International license. 1 2 3 4 5 6 7 8 Fitzgerald, Alan (1987). Canberra in two centuries: A pictorial history. Clareville Press. pp. 4–5, 12, 92–93, 115, 128. ISBN 0-909278-02-4. 1 2 Gillespie, Lyall (1984). Aborigines of the Canberra Region. Canberra: Wizard (Lyall Gillespie). pp. 1–25. ISBN 0-9590255-0-2. 1 2 3 4 5 6 Gillespie, Lyall (1991). Canberra 1820–1913. Australian Government Publishing Service. pp. 3–9, 110–111, 149, 278, 303. ISBN 0-644-08060-4. 1 2 3 4 Fitzhardinge, L. F. (1975). Old Canberra and the search for a capital. Canberra & District Historical Society. pp. 1–3, 31–32. ISBN 0-909655-02-2. ↑ Watson, F. (1931). "Special Article: Canberra Past and Present". Year Book Australia. Retrieved 8 April 2019. ↑ "Kiandra". The Sydney Morning Herald . 5 February 2005. Retrieved 19 February 2010. 1 2 Wigmore, Lionel (1971). 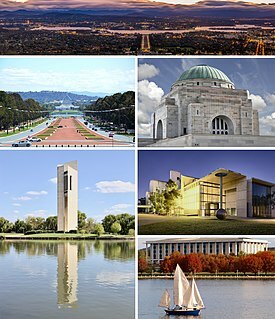 Canberra: history of Australia's national capital. Dalton Publishing Company. pp. 20, 113. ISBN 0-909906-06-8. ↑ Birtles, Terry G. (2004). "Contested places for Australia's capital city" (PDF). 11th Annual Planning History Conference. Retrieved 8 April 2019. ↑ "A4 Report Map of Australia". Geoscience Australia. 16 November 2009. Retrieved 19 February 2010. ↑ "Seat of Government Act 1908 (Cth)". National Archives of Australia. Archived from the original on 17 October 2009. Retrieved 31 January 2010. ↑ "History of the NCA". National Capital Authority. 11 June 2009. Retrieved 26 February 2010. 1 2 Sparke, Eric (1988). Canberra 1954–1980. Australian Government Publishing Service. pp. 30, 170–180. ISBN 0-644-08060-4. ↑ Gibbney, Jim (1988). Canberra 1913–1953. Australian Government Publishing Service. pp. 231–237. ISBN 0-644-08060-4. ↑ Andrews, W.C. (1990). Canberra's Engineering Heritage. Institution of Engineers Australia. p. 90. ISBN 0-85825-496-4. ↑ Overall, John (1995). Canberra: yesterday, today & tomorrow: a personal memoir. Federal Capital Press of Australia. pp. 128–129. ISBN 0-9593910-6-1. ↑ "Australian Capital Territory (Self-Government) Act 1988 (Cth)". National Archives of Australia. Archived from the original on 16 July 2005. Retrieved 21 January 2010. ↑ "Past ACT Legislative Assembly Elections". ACT Electoral Commission. Retrieved 29 January 2010. 1 2 "Turbulent 20yrs of self-government". Australian Broadcasting Corporation. 11 May 2009. Retrieved 31 January 2010. ↑ How were the ACT's boundaries determined? 1 2 3 4 5 6 7 8 9 10 11 "Climate of Canberra Area". Bureau of Meteorology. 12 July 2009. Archived from the original on 19 November 2003. Retrieved 30 March 2019. ↑ "Climate: Australian Capital Territory". en.climate-data.org. Retrieved 30 March 2019. ↑ "Climate statistics for Australian locations: Canberra Airport Comparison". Bureau of Meteorology . Retrieved 3 September 2011. ↑ McLeod, Ron (2003). Inquiry into the Operational Response to the January 2003 Bushfires in the ACT (PDF). 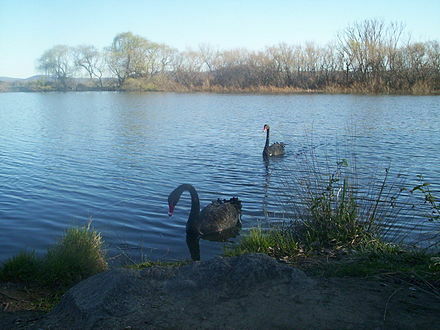 Canberra, ACT. ISBN 0-642-60216-6. Archived (PDF) from the original on 14 May 2013. ↑ "State Circle Cutting (Place ID 105733)". Australian Heritage Database . Department of the Environment. ↑ Antony Green (22 September 2016). "Summary of Candidates and Parties Contesting 2016 ACT Election". ABC Elections. ↑ "Australian Capital Territory (Self-Government) Act 1988 – Sect 39". ↑ "Disallowance powers removed from ACT self-government legislation". News, Events and Conferences. ACT Legislative Assembly. Archived from the original on 23 May 2012. Retrieved 5 November 2012. ↑ "Territories Self-Government Legislation Amendment (Disallowance and Amendment of Laws) Act 2011 (Cth)". ComLaw . Retrieved 14 September 2013. ↑ "Crime". Australian Federal Police. ACT Policing. Retrieved 23 February 2019. ↑ Benjamin Spagnolo (22 October 2015). The Continuity of Legal Systems in Theory and Practice. Bloomsbury Publishing. p. 65. ISBN 978-1-84946-884-8. While the Jervis Bay Territory was constituted as a separate Territory on acceptance by the Commonwealth, it was 'annexed' to the Federal Capital Territory, to the extent that the laws there in force from time to time were 'applied' in the still legally distinct Jervis Bay Territory. ↑ "Jervis Bay Court". www.courts.act.gov.au. 9 October 2016. Retrieved 8 April 2019. ↑ "Jervis Bay Territory Acceptance Act 1915" . Retrieved 30 November 2015. ↑ "ACT Population Projections: 2018 to 2058" (PDF). ACT Government. January 2019. Retrieved 2 April 2019. ↑ Wigmore 1971, p. 64. 1 2 Sparke 1988, pp. 154–155. 1 2 3 4 "Lake Burley Griffin Interactive Map". National Capital Authority. Archived from the original on 22 May 2009. Retrieved 1 June 2009. ↑ "Locations and opening hours". National Archives of Australia. Archived from the original on 6 October 2012. Retrieved 23 April 2010. ↑ "The Shine Dome". Australian Academy of Science . Retrieved 23 April 2010. ↑ "Visiting the High Court". High Court of Australia. Archived from the original on 17 October 2009. Retrieved 23 April 2010. ↑ "Visitors". Parliament of Australia. Archived from the original on 17 February 2012. Retrieved 23 April 2010. ↑ "Opening hours". Royal Australian Mint. Archived from the original on 18 May 2013. Retrieved 17 September 2013. ↑ "Outdoor and Nature". Visit Canberra. Archived from the original on 31 December 2010. Retrieved 23 April 2010. ↑ "Canberra Museum and Gallery". ACT Government. Archived from the original on 11 May 2013. ↑ "Lanyon". ACT Museums and Galleries. Archived from the original on 30 October 2009. Retrieved 13 May 2010. ↑ "Minders of Tuggeranong Homestead". Chief Minister's Department . Retrieved 13 May 2010. ↑ "Mugga-Mugga". ACT Museums and Galleries. Archived from the original on 30 October 2009. Retrieved 13 May 2010. ↑ "Blundells Cottage". National Capital Authority. Archived from the original on 1 May 2013. Retrieved 13 May 2010. ↑ "Calthorpes' House". ACT Museums and Galleries. Archived from the original on 25 October 2009. Retrieved 13 May 2010. ↑ Atkinson, Ann; Knight, Linsay; McPhee, Margaret (1996). The Dictionary of Performing Arts in Australia: Opera, Dance, Music. Allen & Unwin. pp. 46–47. ISBN 1-86448-005-X. ↑ Daly, Margo (2003). Rough Guide to Australia. Rough Guides. p. 67. ISBN 1-84353-090-2. ↑ "Fact sheets". National Archives of Australia. Archived from the original on 9 August 2011. Retrieved 17 September 2013. ↑ Vaisutis 2009, pp. 283–285. ↑ Universal Publishers 2007, pp. 10–12. ↑ Vaisutis 2009, pp. 278. ↑ Wigmore 1971, p. 87. ↑ Waterford, Jack (3 March 2013). "History of a paper anniversary". The Canberra Times. Fairfax Media. Archived from the original on 17 September 2013. ↑ "Subscription television". TransACT. 11 June 2009. Archived from the original on 28 September 2013. Retrieved 25 September 2013. 1 2 "Hospitals". ACT Health. Archived from the original on 26 March 2011. Retrieved 23 April 2010. ↑ "Canberra Hospital". ACT Health. Archived from the original on 16 July 2010. Retrieved 23 April 2010. 1 2 "Contact Us & Location Map". Calvary Health Care ACT. Archived from the original on 23 March 2010. Retrieved 23 April 2010. ↑ "Public Hospital". Calvary Health Care ACT. Archived from the original on 18 July 2008. Retrieved 23 April 2010. ↑ Cronin, Fiona (12 August 2008). "Chemo crisis to hit ACT patients". The Canberra Times . Archived from the original on 13 November 2011. Retrieved 23 April 2010. ↑ "Welcome to Calvary John James Hospital". Calvary John James Hospital. Retrieved 23 April 2010. ↑ "About Emergency". ACT Government Health Information. Archived from the original on 11 October 2009. Retrieved 23 April 2010. ↑ "About Us". ACT Emergency Services Authority. Archived from the original on 22 August 2011. Retrieved 23 April 2010. ↑ "What is NETS?". Newborn Emergency Transport Service. Archived from the original on 23 December 2007. Retrieved 23 April 2010. 1 2 "Canberra's transport system" (PDF). Parliament of Australia. Archived from the original (PDF) on 7 February 2012. Retrieved 23 April 2010. ↑ Penguin Books Australia 2000, pp. 23–25. ↑ Penguin Books Australia 2000, pp. 3–6, 32–35, 53–59, 74–77, 90–91, 101–104. ↑ "ACT Road Hierarchy". ACT Government. 21 August 2012. Retrieved 14 February 2014. ↑ "Survey shows speeding at disputed camera site". Chief Minister's Department. 17 July 2007. Retrieved 23 April 2010. ↑ "Speeding". Australian Federal Police. 20 May 2008. Archived from the original on 12 November 2009. Retrieved 23 April 2010. ↑ Universal Publishers 2007, pp. 57, 67, 77. ↑ Universal Publishers 2007, pp. 1–100. ↑ "Corporate". ACTION . Retrieved 25 February 2014. ↑ "About Us". Transborder Express . Retrieved 23 June 2017. ↑ "About Us". Qcity Transit . Retrieved 23 June 2017. ↑ Australian Bureau of Statistics (27 June 2017). "Canberra – Queanbeyan (Canberra Part)". 2016 Census QuickStats. Retrieved 29 October 2017. ↑ "Taxi company 'not concerned' at losing monopoly". Australian Broadcasting Corporation. 3 February 2007. Archived from the original on 18 February 2011. ↑ "Uber launches in ACT as Canberra becomes first city to regulate ride sharing". Australian Broadcasting Commission. 31 October 2015. Archived from the original on 1 November 2015. ↑ McIlroy, Tom (30 October 2015). "Uber goes live in Canberra with more than 100 drivers registered". The Canberra Times. Fairfax Media. Archived from the original on 5 November 2015. ↑ "ACT chief minister launches regulated Uber in Canberra, calling it 'a real step forward'". The Guardian. 30 October 2015. Archived from the original on 3 November 2015. ↑ "Fully-regulated Uber services start in Canberra". Australian Financial Review. Fairfax Media. 30 October 2015. Archived from the original on 30 October 2015. 1 2 "Southern timetable" (PDF). NSW Trainlink. 30 September 2018. ↑ "Travel pass agencies". CountryLink. 14 December 2009. Archived from the original on 20 February 2011. Retrieved 23 April 2010. 1 2 3 Penguin Books Australia 2000, pp. 20. 1 2 Penguin Books Australia 2000, inside cover. ↑ "Departures". Canberra Airport. Archived from the original on 2 September 2012. Retrieved 13 May 2010. ↑ "Singapore Airlines flight arrives in Canberra, first direct international flight in more than a decade". Australian Broadcasting Corporation. 21 September 2016. Archived from the original on 21 September 2016. ↑ "Designated International Airports in Australia". Australian Government Department of Infrastructure and Regional Development. 27 February 2013. Archived from the original on 10 May 2013. ↑ Hogan, Richard (July 2003). "Farewell to Fairbairn". Air Force. Royal Australian Air Force. 45 (12). 1 2 "Mount Majura Solar Farm powers up in ACT". Solar Choice. 11 October 2016. Retrieved 6 January 2016. ↑ "What we do". ACTEW. Archived from the original on 3 April 2015. Retrieved 22 March 2015. ↑ "About our business". ActewAGL . Retrieved 25 February 2014. ↑ "The Water Network". ActewAGL. Archived from the original on 28 March 2015. Retrieved 22 March 2015. ↑ "Fyshwick Sewage Treatment Plant". ActewAGL. Archived from the original on 12 March 2015. Retrieved 22 March 2015. ↑ "Lower Molonglo Water Quality Control Centre". ActewAGL. Archived from the original on 12 March 2015. Retrieved 22 March 2015. ↑ Independent Competition and Regulatory Commission (October 2003). "Review of Contestable Electricity Infrastructure Workshop" (PDF). p. 13. Archived from the original (PDF) on 20 April 2013. Retrieved 10 May 2010. ↑ "The Founding of Canberra". The Sydney Morning Herald. 14 March 1913. p. 5. Archived from the original on 18 February 2014. ↑ "20048. Kingston Powerhouse Historic Precinct (Entry to the ACT Heritage Register)" (PDF). ACT Heritage Council. Retrieved 11 October 2014. ↑ "Australia's largest solar farm opens in the ACT" (Press release). ACT Government. 3 September 2014. Retrieved 11 October 2014. ↑ "Mugga Lane solar farm opens, bringing ACT to 35 per cent renewable energy". The Canberra Times. 2 March 2017. Archived from the original on 2 March 2017. Retrieved 1 December 2017. ↑ "Government unveils 36,000 new solar panels at Williamsdale". The Canberra Times. 5 October 2017. Archived from the original on 29 November 2017. Retrieved 1 December 2017. ↑ "2015–16 Annual Feed-in Tariff Report" (PDF). ACT Government. p. 7. Archived (PDF) from the original on 9 March 2017. Retrieved 8 December 2017. ↑ "8146.0 – Household Use of Information Technology, Australia, 2014–15". 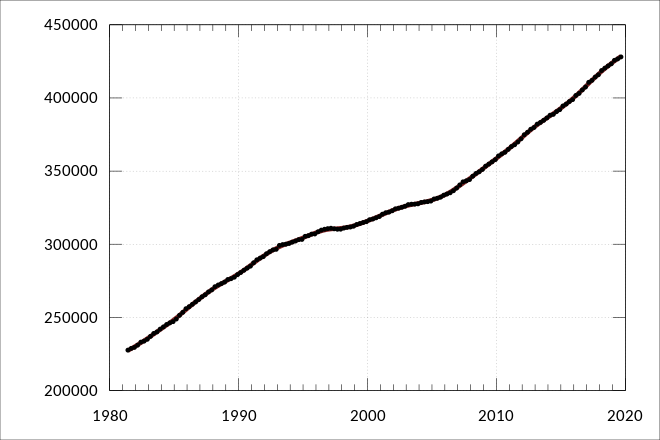 Australian Bureau of Statistics. 18 February 2016. Retrieved 4 January 2017. ↑ "Australian Capital Territory is Australia's best economy". International Business Times . 18 January 2011. Retrieved 11 February 2016. ↑ "CommSec State of the States places NSW economy first". 27 January 2016. Retrieved 22 June 2016. 1 2 Jervis-Bardy, Dan (29 January 2019). "'Glitter starting to fade': ACT economic growth to slow". The Canberra Times. Retrieved 9 April 2019. 1 2 3 4 "Fact sheets for countries, economies and regions: Australian Capital Territory" (PDF). Department of Foreign Affairs and Trade. 2018. Retrieved 9 April 2019. 1 2 Kennedy, Maddison (July 2017). "The ACT economy still going strong". Dixon Advisory. Retrieved 9 April 2019.